One of the three bouts from the 2019 WWE Royal Rumble pre-show was the highest rated match of the night in this week's issue of the Wrestling Observer Newsletter. Dave Meltzer graded the WWE Cruiserweight Championship match - which saw Buddy Murphy successfully retain his strap against Hideo Itami, Kalisto and Akira Tozawa - four stars. From a betting perspective, the match obliterated the favourite going into the show - Daniel Bryan versus AJ Styles - as the WWE Championship contest scored only two-and-three quarter stars. You'll see in the table below that the Kambi oddsmakers priced the eventual winner at 12/1. The customers evidently took the favourite. Bryan and Styles stole the show at last month's WWE Tables. Ladders and Chairs show, so it's likely that some punters were gambling on a repeat performance. As the 'WWE Championship' selection fell to 1/7 from its opening 7/10, the bookies increased the fatal four-way from 12s into 15/1. With the four stars being the most in Dave Meltzer's review of the event, another market specific to the highest rated match of the night was settled with the four stars, that was available at 2/1 throughout the weekend, in the 'Exact Star Rating Of The Highest Rated Match' special. There were two head-to-head markets available on the weekend of the show. In one of the markets, customers could bet on which match, out of Brock Lesnar .vs. Finn Balor or the Men's Royal Rumble, received the most stars in Meltzer's review of the event. The Universal Championship selection won this particular market as it received three-and-three quarter stars. This was half a star more than the Rumble. As you can see from the betting, the customers sided with the eventual winner before showtime. The price went from 7/10 into 3/5 while the two other options - 'Men's Royal Rumble' and the option to wager on a tie - drifted out. It was the tie that won in the second head-to-head market. The two women's championship matches received three-and-three-quarter stars each. Therefore, 'Same Amount' was the winning selection. Customers could have found it at 9/4 or - at a latter point - 23/10. 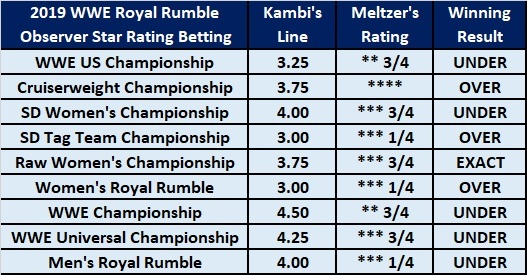 In my opinion, the best Observer markets of every WWE PPV weekend are the over/under specials where the bookmaker makes an estimate on each match and the customer has to predict whether the match in question is given over, under or exactly on the line when Meltzer's review is released. I chose two matches to go over the line. These were the Smackdown Tag Team Championship and Women's Royal Rumble matches. Both had lines of three stars and both ended up hitting the over by quarter of a star each. I lucked out with the Women's Royal Rumble match because, as I wrote over the weekend, I felt that it had potential to beat the three-and-a-quarter stars from last year. Fortunately, the line was three. The reviewer gave it the same score as last year. I felt that the 2018 Rumble was better after watching this year's offering. Another thing I may have lucked out on was a bet I didn't place. Going into the weekend, I hoped the line for the Raw Women's Championship match would be set at 3.50. When I saw it at 3.75, I backed off. I sensed there was a chance it could hit three-and-three-quarters but was not confident enough to bet on 'Exactly 3.75' as I prefer to take 'Over' or 'Under'. 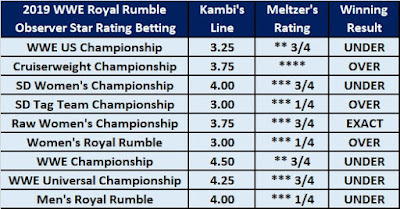 Hopefully, we'll see if I can continue this mini streak next month with star rating markets for WWE Elimination Chamber 2019.